Putting customers at the center and better understanding demand for financial services among different segments of an unbanked population is a key priority for the development community. The recent Making Access to Financial Services Possible (MAP), undertaken by UNDP/ UNCDF, CENFRI and Finmark Trust with funding from LIFT, provides a gold mine of information on the demand for and supply of financial services in Myanmar. It is based on interviews with 5,100 households, and the results were presented on 22 and 23 May at a conference in Naypiytaw. 70 percent of households are rural with close to five people in the house. The level of education is generally very low, with only one-third of people going beyond primary school. Houses are typically made of timber and bamboo with a tin roof and electricity is only available for a few hours a day, if at all. It takes people one hour and 30 minutes to get to the closest bank branch. Forty-two percent of adults claim they have access to a mobile phone, although this varies from one region to the other. In terms of economic activities, over half of adults are involved in farming, primarily rice. The poverty rate is very high and about half of income earners make less than $2 a day. People’s largest expenses are on education (34 percent), followed by health and electricity. A man repairs a fishing net. Photo by Khant Zaw. Culturally, borrowing is not viewed very positively and 88 percent of people interviewed think that it is bad for future lives if one dies owing money. Only five percent of people have access to a bank account and less than five percent have a savings account, lower than what we at CGAP and IFC originally expected. More than half of the respondents to the survey said that they would need formal employment to be able to open an account, and 63 percent of respondents say they do not have enough money to save anyway. Thirty percent of people have access to at least one form of financial service (credit, savings, insurance and remittances), but if we remove remittances from the equation, the number financially included drops to just 20%. Most of the financial access comes through the Myanmar Agriculture Development Bank, a state-owned institution, regulated pawn shops, and PACT, the leading microfinance institution which UNDP has supported since it started. Given the lack of formal supply, many people turn to informal financial sources. The survey highlighted the very significant role of the informal sector. Family, friends, and money lenders are the primary sources of debt in Myanmar. In fact, there are five times more people who borrow from informal sources than from a formal provider. Nearly 6 million adults borrow from unregulated money lenders each year, and there is a total outstanding debt of $3.9 billion. Seventy percent of adults think it’s important to save, even when income is low. Most people save at home, in the form of livestock or gold. There seems to be pockets of over-indebtedness with two percent of respondents claiming they cannot pay back their debts, possibly due to very high interest rates from money lenders. Usage of other formal financial services in Myanmar is also very low. Only 11 percent of adults had received domestic remittances and nine percent had received money from abroad, mainly from Thailand. The usage of insurance is almost non-existent with only 30 percent of people even knowing about insurance. An interesting feature of the survey given the upcoming launch of Ooredoo and Telenor is the fact that one-third of interviewees are interested in using phones to transfer money and make payments. Graphic showing target markets for financial inclusion in Myanmar. Source: Making Access Possible Myanmar Synthesis Note. 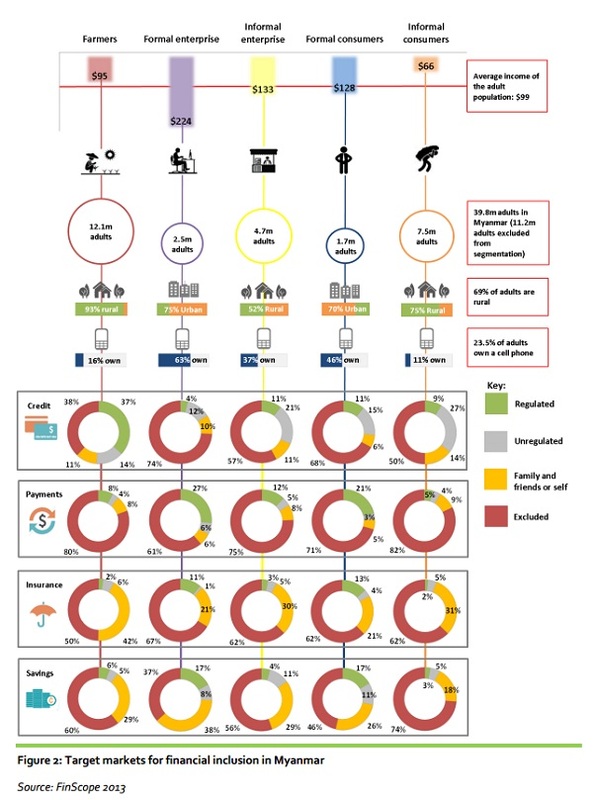 The MAP Study segmented the market into five target groups for financial inclusion in Myanmar: Farmers, Formal Enterprises, Informal Enterprises, Formal Consumer market, Informal Consumer Market. The diagram below summarizes credit, payment, insurance and savings for each target market. So what comes next? First, different stakeholders (providers, policy makers, donor and investors) are starting to use all the data and findings to guide their policies. This is part of the objective of MAP. The data raises several key questions such as: how can policy makers support the expansion of savings with such low usage of formal savings services? How can the sector become more sustainable since it is now highly subsidized? How can telcos and other players fill the huge gap in terms of payments? This data will serve as an input for providers that seek to take a “client-centric” approach and get deeper analysis of the different segments and trends that the MAP has identified. These types of questions will hopefully help Myanmar prioritize which areas should be given the greatest focus. Understanding financial behavior and gaps in available services is the first step to building a more financially-inclusive Myanmar. The report finds that Myanmar’s banking sector so far has found it commercially challenging to extend financial access to the poor. As a result, fewer than 20 people out of 100 have access to formal financial services, with most people relying on family savings or costly alternatives such as informal money lenders. Smartphones Are Common in Myanmar: Is Digital Finance Far Behind? Smartphone penetration of 80 percent and low bank account access suggest that digital financial services will take off in Myanmar. China’s experience may offer clues about how and when this will happen. Perhaps the key priority is to raise rural income ie better prices for farm crops, higher farm productivity, loans for farm equipment. One has to have income in order to even open an account. Agents can be appointed to open basic accounts for rural folks, and mobile phones can be used to pay for services or goods even in the rural setting. Its a very nice and informative article. Helps me in my current work and understanding.